New website featuring 2015 model hovercraft! Our new website is finally here! Featuring all of the new 2015 Hoverstream hovercraft models, plus enhanced information and layout. There is a handy new “compare models” table that quickly shows the primary differences between each hovercraft. For 2015, all three hovercraft are new models. The Snapper is a single seat model offering incredible fun at a very low price. The Marlin III is the latest and greatest update to the most popular recreational hovercraft in the world. It is a 2-3 person model offering the perfect balance of price, features, and performance. Finally, the Coastal Pro II is the new version of our successful Coastal Pro line. It’s now larger and twin engine, offering performance and value that is unmatched by any other similar sized hovercraft in the world! Finally, our new “Specials” tab features our current discounts and promotions. 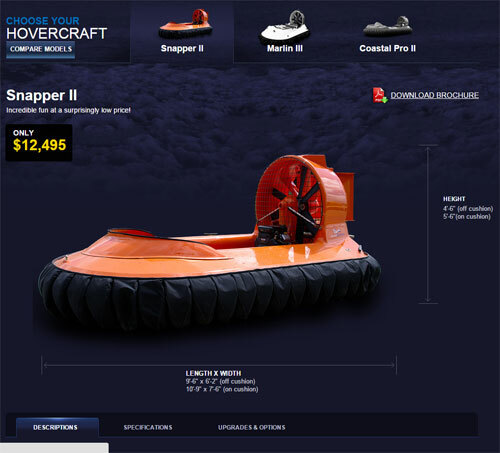 Here you’ll find discounted hovercraft and special offers from Hoverstream. Right now we have three of our 2014 hulls on sale with huge discounts to make room for the 2015 inventory. How about a demo Marlin with only 11 hours for $3,000 off, a yellow Coastal Pro I with the most popular options for $4,000 off, and finally, one of our exclusive Toyota Duck Pro models. This is a Coastal Pro I modified with a whopping 80 horsepower Toyota automotive engine, a full camo wrap, and a look that is nearly invisible from a duck’s perspective!